So now that we’ve all read Mockingjay, the third book in Suzanne Collins’ Hunger Games trilogy—and have (hopefully!) finished processing everything that happened—the question is, what should we read next? I’m on the lookout for another great YA dystopia because I love how they create new worlds with exaggerated versions of the flaws within our own society. It really makes you think about the path we’re on and what the consequences of our actions might be. With all the craziness of reality TV, can’t you just see a Hunger Games type show in our not-to-distant future? **shudder** I also love that the protagonists of these books are not afraid to standup and fight for what they believe in, which often goes against everything they’ve been taught. I think we all aspire to be that brave in our own lives. 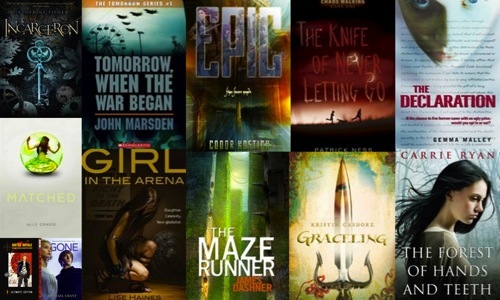 While looking for the next book I’ll love as much as The Hunger Games, I put together a list of YA dystopias that sound promising. Check it out below. Matched won’t be released until November 30th, but I’ve been hearing really good things from people who received advanced copies. In fact, the movie rights for the book were just sold to Disney. If the Peeta/Gale/Katniss love triangle was one of your favorite parts of The Hunger Games, you should check out Matched. This is the first book in the Chaos Walking trilogy. The third book, Monsters of Men, will be out on September 28th. On New Earth, society is governed and conflicts are resolved in the arena of a fantasy computer game, Epic. If you win, you have the chance to fulfill your dreams; if you lose, your life both in and out of the game is worth nothing. When teenage Erik dares to subvert the rules of Epic, he and his friends must face the Committee. If Erik and his friends win, they may have the key to destroying the Committee’s tyranny. But if they lose . . . This is a manga adaption of a Japanese film with a premise that is very similar to that of The Hunger Games. Warning: It’s extremely graphic and not suitable for children. One ninth-grade class, 42 students, marooned on an island and forced to kill or be killed in a government-sanctioned, televised game called The Program. The rules: after three days, only one student can remain alive or they all die. Weapons are handed out and each student is sent out into the field alone–unprepared for the horror that awaits them. Many classmates quickly turn on each other in this twisted battle for survival, but amid the betrayals and rising body count, new friendships are forged and existing love gives new meaning to the phrase, “Till death do we part.” With a hard-hitting English adaptation by acclaimed writer Keith Giffen, this series is brutal, honest…and not to be missed. As a modern gladiator’s daughter, Lyn and her family live by the rules of the Gladiator Sports Association. But those rules can turn against you. When Lyn’s seventh father dies in the ring, his opponent, Uber, captures Lyn’s dowry bracelet—and her hand in marriage. To win her freedom, Lyn will do what no girl has done before: enter the arena and fight her father’s murderer—even though she’s falling in love with him. In the year 2140, it is illegal to be young. This zombie novel might be more paranormal than dystopian, but I’ve heard great things about it and wanted to include it on this list.